Taxes are our least favorite thing to do! I really don’t know that many people who get excited about it. 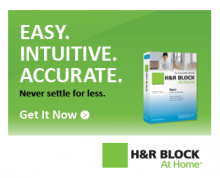 Both H&R Block and Turbo Tax are offering FREE editions for you to use. This may make filing a little easier. You can prepare, print and eFile for free. Click the links below for more information on how to take advantage of these free offers!